Granatowska, Hauptman, Heinberg, Kreisberg, Messner, Wagmann..
Bulsziewicz, Flakowicz, Polakiewicz, Walakiewicz, Walkowiecka. Total Population: 1,978; Jewish Population: 22. Landowners:38; Jewish Landowners: 21. The town names and geographical coordinates an be found at the US Board on Geographic Names (US BGN), which has been used by the JewishGen Gazetteer. http://www.jewishgen.org/Communities/LocTown.asp. The first column lists the town name as it was known before 1939; the next column lists the current names found in US BGN; and the third column contains alternative spellings. The figures for the Jewish population are taken from Where once We Walked : A Guide to the Jewish Communities Destroyed in the Holocaust: A Guide to the Jewish Comunities Destroyed in the Holocaust by Gary Mokotoff and Sallyann Sack with Alexander Sharon, Bergenfeld, N.J.: Avotaynu, 2002. Researchers can search for these places in Jewishgen's Gazeteer. Information about Boryslaw and Drohobycz will be found on thei pages dedicated to these towns. Village incorporated within Boryslaw in 1891. Begleiter, Borgman, Draźnin, Kraft, Krysko, Kusnierz, Luko, Ohrynowicz, Rothman, Soles, Wojtasiewicz. Three landowners: Joseph Kolischer & Co., Count Leo Sapieha, Countess, Marie Lubomirska. Kupferberg, Merkling, Moht, Moszkowski, Suchowierski. Total Population: 1,925; Jewish Population: 47.Landowners: 47; Jewish Landowners: 28. Total Population: 1,580; Jewish Population: 39. Landowners: 27; Jewish Landowners: 7. Total Population: 1,421; Jewish Population: 23. Landowners: 8; Jewish Landowners: 5. Total Population: 1,659; Jewish Population: 7. One landowner with farm and mansion: Zofia Strzelecka. Other names: Kowalów, Mager, Rudek, Szwarc. Total Population: 1,769; Jewish Population: 41. Landowners:18; Jewish Landowners: 5. Total Population: 1,897; Jewish Population: 50. Total Population: 642; Jewish Population: 21. Antonik, Danylko, Kornilo, Krysztal, Leon, Pylo, Szumski. Total Population: 653; Jewish Population: 0. Landowners: 22; Jewish Landowners: 16. Total Population: 463; Jewish Population: 17; Landowners: 22; Jewish Landowners::16. Aufseher, Blam, Fileuran, Gerber, Hausman, Tannenbaum. Total Population: 463; Jewish Population: 17. Landowners:7; Jewish Landowners: 7. Scheinfeld, Schõnfeld, Serfas, Steciwka, Tracz, Żahalak, Ziegler. Total Population: 1,974; Jewish Population: 51. Landowners:16; Jewish Landowners: 0. Total Population: 2,203; Jewish Population: 27; Landowners: 102; Jewish Landowners: :21. Freiman, Kruczy, Łuczko, Mieczko, Rakowski, Terlecki, Zacharja. Hauptman, Krysztal, Luftszein, Pretczok, Rosenberg, Skolyc, Wechselberg. Total Population: 1,834; Jewish Population: 175. Many villages were part of an estate that in early times belonged to the Polish landed aristocracy. In the nineteenth century, wealthy businessmen, some of them Jews, bought some of these estates from their original owners. This was the manor house on Julius Bielski's state in Rychcice. The name Majdan means "open space," sometimes "an open yard within the farmstead," depending on the dialect of Ukrainian of the area. There are several places in Poland and in Ukraine that are known as Majdan (Maydan) including some in Galicia. Majdan in the Drohobycz Administrative District is a village west of Kropiwnik (Stary and Nowy), and Schodnica. It is located on the stream, Rybnik, a tributary of the River Stryj not far away. Only one road leads to and from the village. 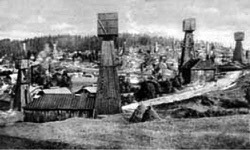 Mraźnica was a very important centre for the oil industry. It was later incorporated into the town of Borysław. Total Population: 1,028; Jewish Population: 38. Agricutural Estates: 47; Jewish Agricultural Estates: 35. Total Population: 1,216; Jewish Population: 29; Agricutural Estates: 5; Jewish Agricultural Estates:: 4. Four landowners with farm and mansion: Julius Bielski, J. Frenkel, Josef Kolischer, Prince S. Sapieha. Rurion, Schneider, Senniko, Wachmyrz, Zielichowski. Total Population: 2,140; Jewish Population: 42. Landowners: 13; Jewish Landowners: 7. Total Population: 2,098; Jewish Population: 41. Forst, Horski, Katz, Kirchner, Lang, Orski, Osziewicz, Podolczak, Schmiedt, Spielmann, Zacharko. Total Population: 2,049; Jewish Population: 21; Landowners: 13; Jewish Landowners: 13. Szydlowska, Tambor, Truskawiecki, Turak, Wang, Weber. Total Population: 1,552; Jewish Population: 115. Baumkittner, Chaławka, Holubińka, Kobylecki, Łosiuk, Nawrocki. Total Population: 1,898; Jewish Population: 36; Landowners: 15; Jewish Landowners: 6. Prokopyszak, Rosenbach, Solanyk, Swiszcz, Swiszer. Total Population: 1,647; Jewish Population: 138. Landowners: 69; Jewish Landowners: 37. German Settlement. Alternative Names: Korostnitsa, Jozefsberg..
Current Ukrainian Name: Nizhniye Gai: Alternative Names: Gaye Nizhne. Current Ukrainian Name: Wierkhniye Gai: Alternative Names: Gaye Vyzhne. Current Ukrainian Name: Wierkhniye Gai: Alternative Names: Gorucko, Gorskoye. Current Ukrainian Name: Grushev; Alternative Names: Hrushov, Gruszewo. Current Ukrainian Name: Gubiche; Alternative Names: Gubycze, Gubitse, Gubice. Current Ukrainian Name: Yasenitsa Solnaya; Alternative Names: Yasenitsa Solna. This town name, not shown on modern maps, was probably incorporated within Drohobych or nearby Stebnik. Begstein, Bihnur, Dubowa, Jahling, Kozań, Kulyk, Scheinfeld, Wendel. Total Population: 983; Jewish Population: 26; Landowners: 13; Jewish v: 7. Total Population: 1,259; Jewish Population: 29. Heuchert, Hohn, Mayer, Mohr, Muschal, Schmidt, Tempel. Total Population: 787; Jewish Population: 0; Landowners: 9; Jewish Landowners: 0. Total Population: 912; Jewish Population: 8. Current Ukrainian Name: Kropivnik Novyy; Alternative Names: Kropevnik Novy. Total Population: 1,075; Jewish Population: 56. Agricutural Estates: 12; Jewish Agricultural Estates: 55. Current Ukrainian Name: Kropivnik Staryy; Alternative Names: Kropivnik Stary. Lewicki, Otto, Skolski, Süssman, Szumyn, Wild. Total Population: 1,425; Jewish Population: 25. v: 48; Jewish Landowners: 21. Total Population: 1,161; Jewish Population: 42; Landowners: 8; Jewish Landowners: 8. One landowner with farm and mansion: Josef Kolischer. Other names: Borak, Goldfischer. Total Population: 2,816; Jewish Population: 81; Landowners: 28; Jewish Landowners: 15. Egert, Geisler, Kopp, Schnepf, Stachner, Terlecki, Waszewski..
Current Ukrainian Name: Leshna; Alternative Names: Kropivnik Stary. Eisenbart, Kindyj, Kopacz, Kupferberg, Malasycz, Romanow, Rosenberg, Tauber..
Hauser, Lerikstein, Liskawicz, Modrzyski, Tadak. Total Population: 1,065; Jewish Population: 40. Alternative Names: Luzheck Dolny, Nizhniy Luzhek. Current Ukrainian Name: Maidan; Alternative Names: Maydan. Total Population: 203; Jewish Population: 5. Landowners: 6; Jewish Landowners: 0. Total Population: 2,525; Jewish Population: 229. Landowners: 68; Jewish Landowners: 22. Current Ukrainian Name: Medinichi; Alternative Names: Medenica, Medenitsy. Total Population: 1,256; Jewish Population: 16. Landowners: 39; Jewish Landowners: 19. Current Ukrainian Name: Mikhaylovichi; Alternative Names: Mikhaleviche, Michajlowicze. Tilleman, Tuch, Wesely, Zachkiewicz, Zimmerman. Total Population: 1,045; Jewish Population: 58. Landowners: 13; Jewish Landowners: 5. Oil wells and the manufacture of gasoline. A very important centre for the oil industry. Backenroth, Kupferberg, Liebermann, Lindenbaum, Sussman, Wagmann, Werdinger, Zorn..
Total Population: 627; Jewish Population: 94. Landowners: 181; Jewish Landowners: 55. Total Population: 1,827; Jewish Population: 176. Total Population: 2,330; Jewish Population: 66. Borusiak, Czepil, Ilaczko, Jać, Kucopej, Pilczak, Schõnfeld, Sosiak, Terlecki..
Total Population: 1,088; Jewish Population: 5. Two landowners with farm and mansion: Countess Marie Goluchowska; Baron Johann Liebig. One landowner with farm and mansion: Julius Frey. Other names: Frey, Skarbek. Two landowners with farm and mansion: Count Skarbek, Roman Jarosz. Current Ukrainian Name: Pochayevitse; Alternative Names: Pochayovitse, Poczajkowice. Total Population: 711; Jewish Population: 15. Current Ukrainian Name: Podbuz; Alternative Names: Padbuzh, Pidbish. Tepper, Treiber, Wagshal, Weinreb, Wilf, Wisniewski, Zyblikiewicz. Total Population: 1.885; Jewish Population: 245. Landownerss: 51; Jewish Landowners: 0. Current Ukrainian Name: Podmonastyrek; Alternative Names: Podmonastyrki. Three landowners with farm and mansion: Stephan Grodecki, Zofia Sobolewska, Stan, Źukowski. Other names: Mambach, Powerlak, Skrzeszewski. Total Population: 282; Jewish Population: 13. Landowners: 20; Jewish Landowners: 6. Total Population: 1,382; Jewish Population: 20. Landowners: 87; Jewish Landowners: 26. Current Ukrainian Name: Ripchitse; Alternative Names: Rabchitse. One landowner with farm and mansion: Count Skarbek. Total Population: 1,127; Jewish Population: 26. Landowners: 4; Jewish Landowners: 3. One landowner with farm and mansion: Josef Kolischer. Total Population: 801; Jewish Population: 5. Landowners: 21; Jewish Landowners: 16. Total Population: 922; Jewish Population:11; Landownerss: 8; Jewish Landowners: 5. Jedlicki, Josefów, Kurzwek, Selniger, Szram. Total Population: 742; Jewish Population: 25. Landowners: 6; Jewish Landowners: 3. Three landowners with farm and mansion: A. Krawców; P. Terlecki, L. Zuckerberg..
Soroka, Szuluk, Terlecki, Wechselberg, Zuckerberg..
Total Population:1,435; Jewish Population: 35. Landowners: 115; Jewish Landowners: 67. Total Population: 284; Jewish Population: 7. Landowners: 11; Jewish Landowners: 0. Total Population: 660; Jewish Population: 0. Current Ukrainian Name: Rovnoye; Alternative Names: Kenigsau, Ruvne. Backenroth, Goldberg, Hauptman, Hnat, Hochler, Kliszcz, Kohut, Langena, Liebig, Müller. Total Population: 841; Jewish Population: 152. Landowners: 25; Jewish Landowners: 0. Current Ukrainian Name: Rykhtiche; Alternative Names: Rikhtichi, Rychticze. One landowner with farm and mansion: Julius Bielski..
Total Population: 2,401; Jewish Population: 34. Landowners: 82; Jewish Landowners: 35. Total Population: 2,922; Jewish Population: 64; Landowners: 64; Jewish Landowners: 9. Total Population: 196; Jewish Population: 8. One landowner with farm and mansion: Count Skarbek. Other names: Wolf. Total Population: 635; Jewish Population: 5. Landowners: 15; Jewish Landowners: 8. Total Population: 744; Jewish Population: 3; . Truskawiec was a famous spa. Lubomirska. Other names: Krieser, Lubomirski, Popper. Total Population: 2,692; Jewish Population: 689; Landowners: 34 JLandowners: 0. Current Ukrainian Name: Solonskoye; Alternative Names: Solon'ske. Borgman, Bukowska, Halpern, Oppel, Rybotycki, Schwarz. Total Population: 804; Jewish Population: 36. Landowners: 10; Jewish Landowners: 0. Total Population: 837; Jewish Population: 37; .Landowners: 11. Current Ukrainian Name: Smolnaya; Alternative Names: Smilna. Two landowners with farm and mansion: Countess Maria Tarnowski, Rakowiec. Total Population: 1,244; Jewish Population: 53. Landowners: 10; Jewish Landowners: 6. Total Population: 1,490; Jewish Population: 47; ..
Solec was incorporated into the administraton of Drohobycz. Total Population: 596; Jewish Population: 8. Landowners: 4; Jewish Landowners: 4. Total Population: 667; Jewish Population: 8. Total Population: 294; Jewish Population: 41. Landowners: 24; Jewish Landowners: 14. Total Population: 381; Jewish Population: 45. Total Population: 2,058; Jewish Population: 164. Landowners: 11; Jewish Landowners: 0. Total Population: 2,341; Jewish Population: 134. Total Population: 1,485; Jewish Population: 30. Total Population: 1,709; Jewish Population: 34; Landowners: 12; Jewish Landowners: 0. One landowner with farm and mansion: Julius Bielski. Total Population: 2,281; Jewish Population: 149.
center of oil exploration and refining. Total Population: 13,293; Jewish Population: 2,803; Landowners: 31 Jewish Landowners: 1. Total Population: 642; Jewish Population: 10. Total Population: 656; Jewish Population: 12. Daum, Frey, Kammermann, Kesselring, Kohler, Schlamp, Werner. Total Population: 222; Jewish Population: 11. Total Population: 206; Jewish Population: 8. Two landowners with farm and mansion: Moses Diamantenstein, Emilja Kulczczycka. Total Population: 2,929; Jewish Population: 68. Total Population: 2,939; Jewish Population: 50. Total Population: 1,169; Jewish Population: 33. Two landowners with farm and mansion: Bawaroski, Komarnicki. Backenwolf, Bandrowsi, Baumwollspinner, Łucowicz, Pietrunczak. Current Ukrainian Name: Vatsovitse; Alternative Names: Votsoviche. Hausman, Kosyk, Pryslaj, Sternbach, Wasylyków. Total Population: 688; Jewish Population: 20; Landowners: 16. Jewish Landowners: 9. Total Population: 881; Jewish Population: 14. .
Current Ukrainian Name: Vola Yakubova. Total Population: 1,406; Jewish Population: 26. Current Ukrainian Name: Voroblevichi; Alternative Names: Vrublevice, Woroblewicze. One landowner with farm and mansion: Count St. Tarnowski,. Current Ukrainian Name: Zalokets; . Matyj, Pakutiak, Rybotycki, Scheiner, Schwarz, Tepper. Total Population: 1,273; Jewish Population: 67. Current Ukrainian Name: Zhdanovka; Alternative Names: Zdjanna. One landowner with farm and mansion: Jan Liebig. Other names: Stark. Total Population: 269; Jewish Population: 7. The information on this page was provided by Alex Sharon. The page was created by Valerie Schatzker.